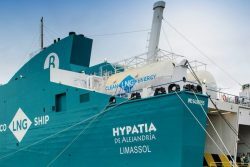 The Hypatia de Alejandría de Baleària, the first smart ship powered by Liquefied Natural Gas (LNG) to sail on the Mediterranean made its first commercial trip between Barcelona and Palma at the beginning of this month. The ferry sailed from Venice where the shipyards in which it has been built are located, Cantiere Navale Visentini. “The Hypatia of Alexandria marks an important milestone both in the history of Baleària and navigation in the Mediterranean, being the first passenger ferry powered by natural gas that crosses these waters, and which will continue in a few months with its twin Marie Curie” , said Adolfo Utor, president of Baleària. The shipping company has invested 200 million euros in the construction of these two vessels, an example of innovation and sustainability, propelled by dual-fuel LNG engines (with a power of 20,600 KW). 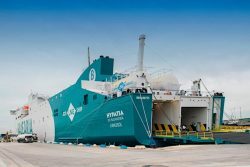 The Hypatia de Alejandría, besides starting a new era in Baleària marked by the use of LNG as fuel, is the first smart ship of the company, which includes technological innovations at the service of the customer to improve their experience on board. The new 186.5 metre ferry has capacity for 880 people, 2194 linear meters of cargo and 166 vehicles. The name of the ship pays tribute to the teacher and scientist Hypatia de Alejandría, who offered unparalleled advances in the fields of mathematics and physics. In total there are six shipping companies that have been baptized with the names of women pioneers in their fields, in line with one of the goals established by the Sustainable Development Goals: equality and the empowerment of women. In addition to Hypatia de Alejandría and its twin Marie Curie, Baleària has the Eleanor Roosevelt under construction at the Armon de Gijón shipyard, Europe’s first fast ferry for passengers and cargo powered by dual-fuel engines that consume natural gas. In addition, the project of remotorization of six of its ships has already begun so that they can also navigate propelled by LNG, which will be carried out over two years and that has received a subsidy from the EU. Baleària’s strategic commitment to LNG, which began eight years ago, responds to criteria of social responsibility and economic profitability, thus anticipating the increasingly demanding regulations on polluting gases. Thus, the shipping company plans to have, in the next three years, at least half of its fleet of ferries navigating with this clean energy, and reach one hundred percent of the fleet within a period of ten years. Liquefied natural gas is a clean and environmentally friendly fuel, and far exceeds current and future regulations on pollution. Its use implies the reduction of CO2 emissions by up to 35%, NOx by 85% and sulfur and particles by 100%, which has an immediate effect in improving air quality and reducing the effect greenhouse. Barcelona welcomes the entry into service of the Hypatia de Alejandría which is in line with Port of Barcelona Air Quality Improvement Plan initiatives aimed at reducing the emissions produced by port activity and minimizing its impact on the environment. The promotion of LNG as an alternative fuel for ships, terminal machinery and trucks is one of the most outstanding actions of this plan.